Hey everyone! My name is Bryce and I am a junior from Hudsonville, Michigan. I am a biology major with a pre-veterinary focus and an environmental studies minor. This fall I will be studying sustainable living in Kaikoura, New Zealand. I love all things outdoors and am really looking forward to what I can learn about sustainable living and what our role as Christians is in maintaining this earth. I hope you follow along on this amazing journey and will take just as many of your own! Adventure is out there! Whanau means family in Maori. 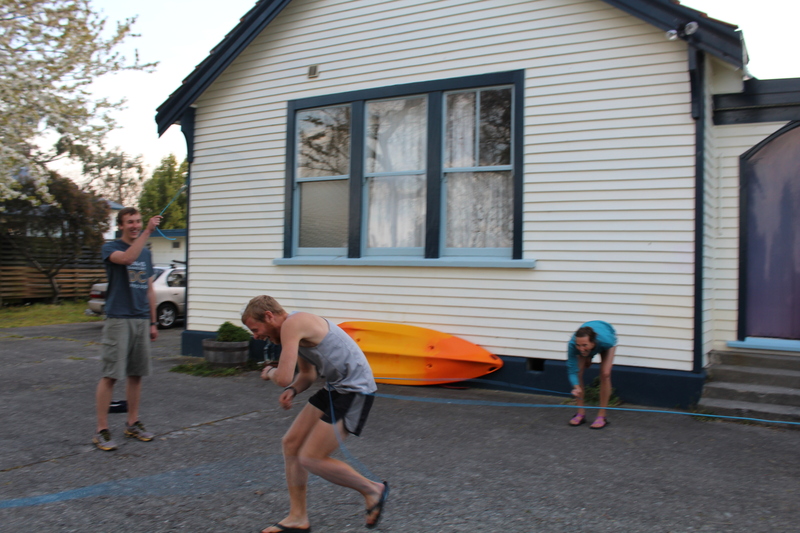 What a beautiful whanau I’ve been blessed with! 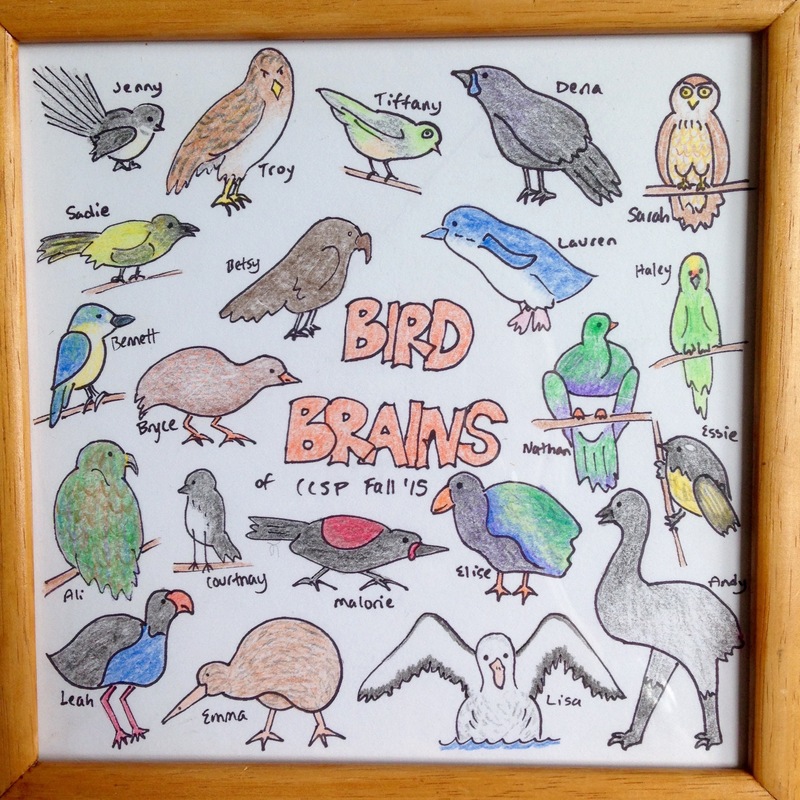 One of the students assigned each of us a New Zealand bird matching our personality as a gift! The bittersweet moment has come. 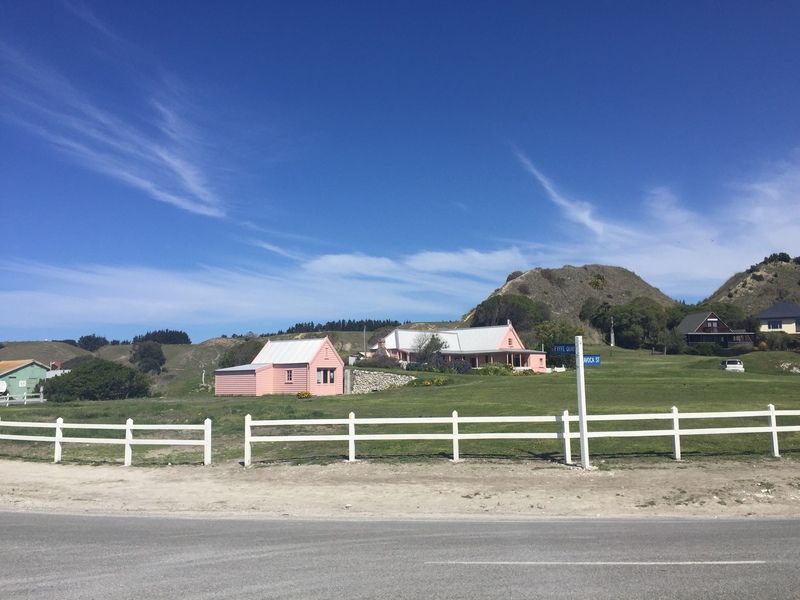 Yesterday, I said “see you later” to 20 new members of my whanau (“family”) and goodbye to the place I’ve come to call home. We spent our final night at the Old Convent celebrating a season of life shared together. We had fish and chips on the beach and shared memories from the semester in a celebration event, giving each other community gifts. Each student was asked to prepare a community gift to share with the students and staff commemorating the semester together. I received notes of love and encouragement, music recordings, friendship bracelets, a cookbook of favorite meals, and a video of memories made during the semester. We ended the celebration sharing communion with one another. Many tears were shed. The fact that we would no longer be living as a community together at the Old Convent, was now a reality. 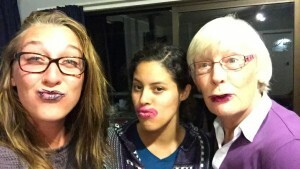 In the last three and a half months, we have become whanau. 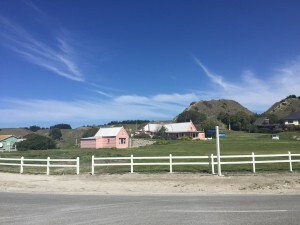 One of the things I’ll miss most is my time spent helping the Kaikoura Ocean Research Institute with their study of the little blue penguins. 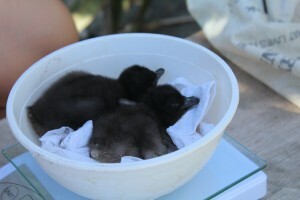 On my last day with them, a new chick had hatched and they allowed me to name him! Following the All Blacks Rugby team theme, I gave him the coach’s name Steve. 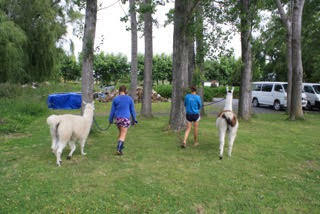 Couldn’t leave without one last llama walk with Sarah! Yesterday I said goodbye to dance parties Monday llama walk day, late night talks in the lounge, contagious laugh circles, and hammock cities in the old walnut tree. 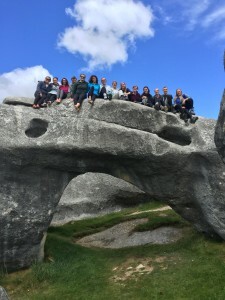 On the other hand, I said hello to 20 beautiful new long-distance friendships that will only continue to flourish (hopefully through visits to Alabama and Iowa and North Carolina and Washington and California and Pennsylvania and New York and South Dakota and, of course, New Zealand). 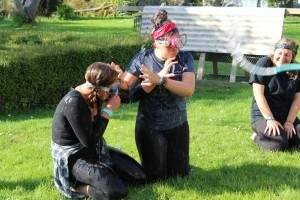 I have so much love for my new whanau and for New Zealand. 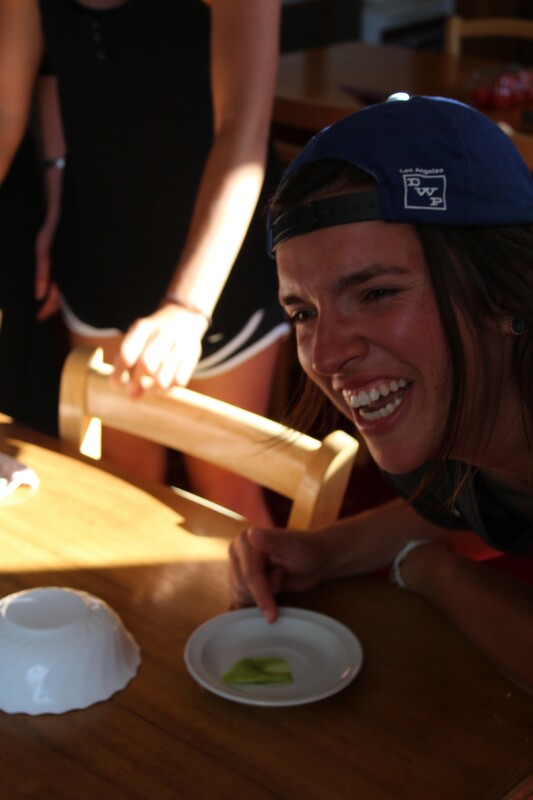 Thank you for a beautifully life-changing semester full of laughter, warm fuzzies, and growth. Saying farewell to New Zealand is hard; a piece of me will always remain in the Old Convent of the little town of Kaikoura. On the other hand, I am beyond excited to take the sustainable living and “doing life together” skills that my semester abroad has taught me, back to Hope. I am beyond excited to invest in my place and make a home once again. 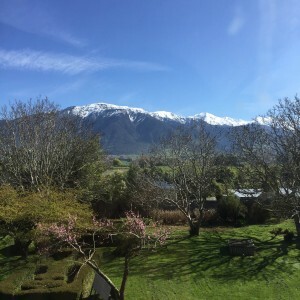 How can Kaikoura not have a special place in my heart with such beauty as this? My heart is so full. Thanks for sharing this journey with me! Llama lots of fun at the Old Convent! 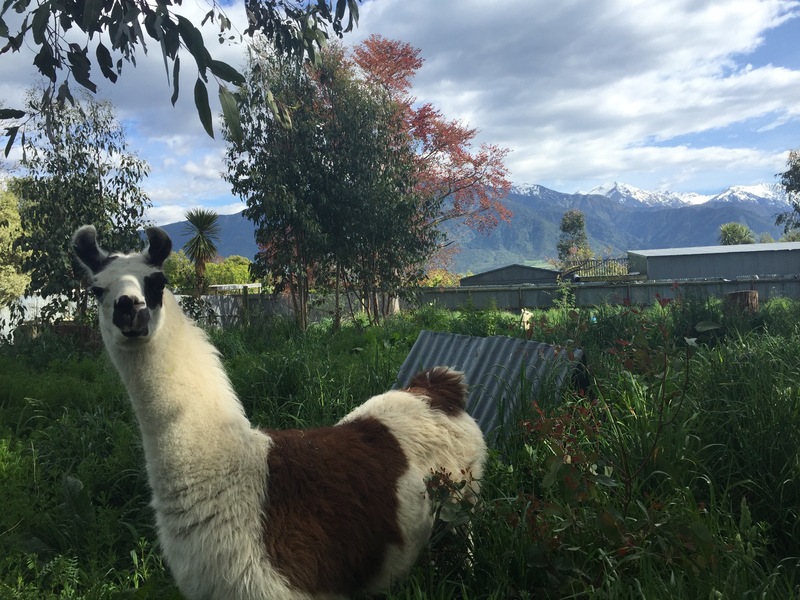 A highlight of life at the Old Convent has been the recent addition of our friends Carlos and Rocky. 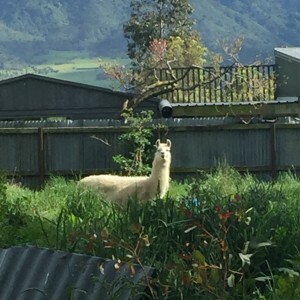 Carlos and Rocky are two retired trekking llamas that have come to live out retirement in the lush green pastures of the Old Convent back paddock. They have made their secret pathways to run on anytime we want to catch them and have their little poo corner that I nearly almost always forget about. 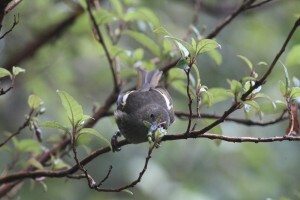 They also love anything and everything green and leafy but have a particular liking for the clovers. We love llamas a LOT here at the Old Convent! A couple weeks after their arrival, a couple students and myself thought Carlos and Rocky looked like they needed a walk. After chasing two llamas in gumboots for an hour, hopelessly trying to lasso them and being dragged by llama strength, we finally managed to summon our superpowers and corner the two before swiftly and calmly applying the harnesses. Their first Convent walk involved a parade around the building followed by a walk down the road. We only got a few stares and a couple laughs from passing cars. Since our first day catching the llamas, every Monday has been Monday Llama walk day in which another student, Sarah, and I take Carlos and Rocky down the road and throughout the Convent property to feast on all the weeds and clovers to their hearts’ content. 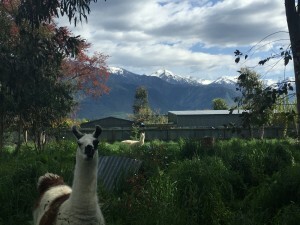 It’s also been really great getting to know the llamas’ personalities through Monday walk days. Carlos is for sure the boss. He’s smaller (and plumper) but feistier. He has the greater spitting capacity as well. Carlos’ favorite leafy green is clover tops but he isn’t picky. On walks, he’ll eat anything and everything he can get his lips on. He also loves to spontaneously start running as I am dragged behind tripping over my gumboots. He’s pretty great. 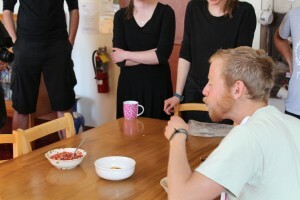 Rock, on the other hand, is more shy and reluctant to eat in unfamiliar territory. It usually requires some hand feeding and slow walking before he begins eating his favorite treat of grasses. Both of them also love to make noises while walking close beside us that sounds like a whining dog. This is Rocky. He is pretty awesome. 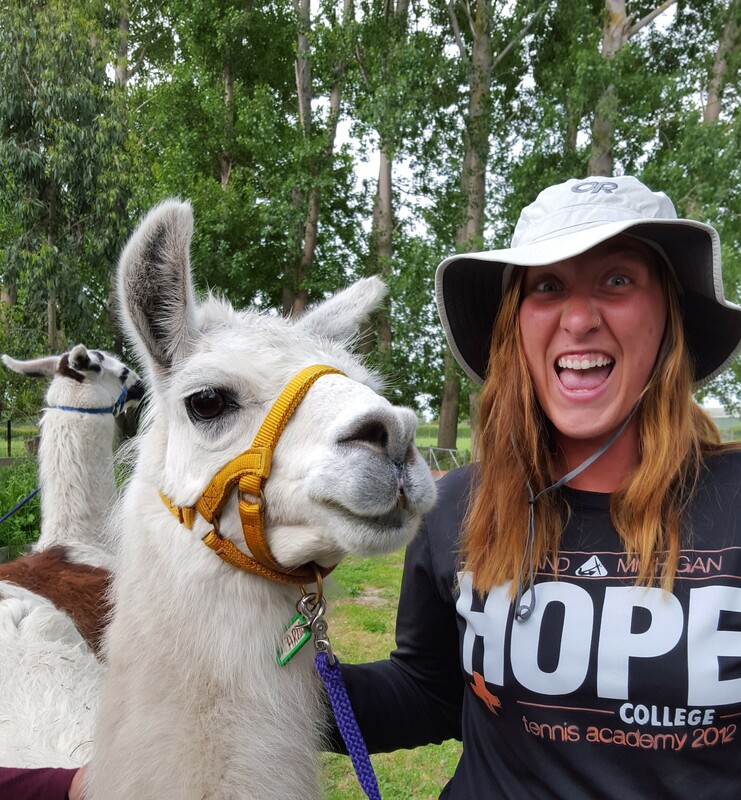 It’s been so great growing closer to another part of creation this semester in learning just how interesting llamas are. I’ll definitely miss my Monday Walk Day buddies, but let’s hope the tradition continues. We’ve managed to get Carlos and Rocky comfortable enough with people here that it now takes less than five minutes to catch them and requires very little chasing a lassoing. We even managed to sneak our llama friends into our semester group photo because they’re basically family, of course! 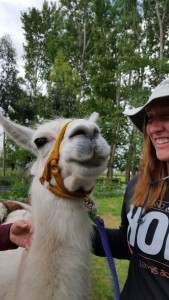 To my dear llama buddies, stay cool, keep spitting, and enjoy all the greens in the world. Posted on December 5, 2015 June 6, 2016 Author Bryce TalsmaCategories Daily LifeTags Oceania/New ZealandLeave a comment on Llama lots of fun at the Old Convent! If I could give any one piece of advice to a future study abroad student it would be this: be invested. You can’t do anything better for yourself while studying abroad than to become invested in the community. It makes goodbyes harder but the memories all the sweeter. Carlos and I have become pretty close this semester through our Monday Walk Days where another student and I take Carlos and Rocky for walks around the property and down the road to snack on some yummy weeds! I have so much love for these beautiful souls! Throughout the semester, I have found myself falling in love with the community here in Kaikoura, New Zealand. 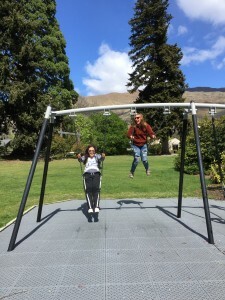 Not only has it been the community at the Old Convent, but the greater Kaikoura community. 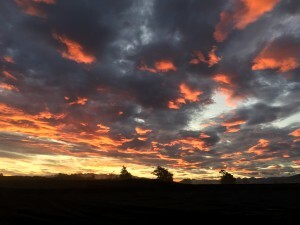 I have grown to love the people at the local New Life Church, attending Sunday services as well as sunrise prayer every Tuesday morning at 6:30am (or as my friend Lisa terms it, “stupid-o-clock”). We pray for each other, the community, and the troubles facing the world today. As a group, we have grown together in our faith and love. It truly is a beautiful thing. 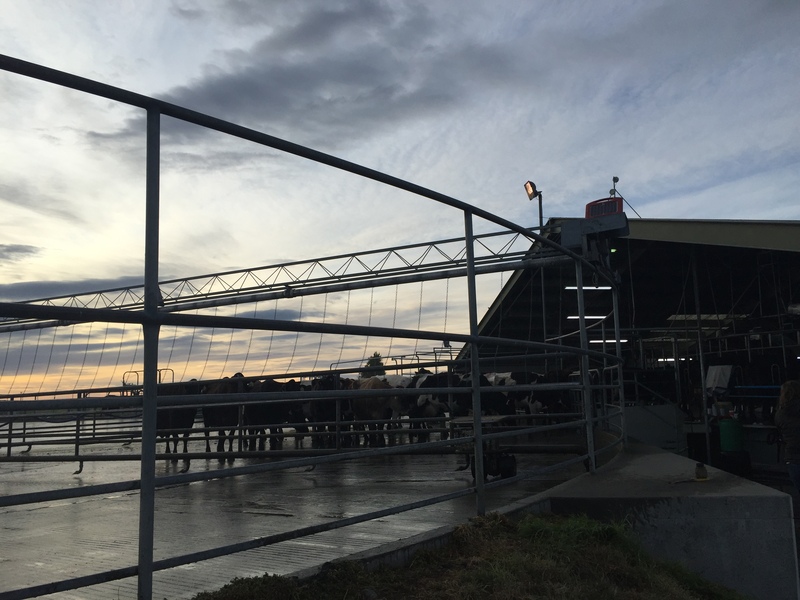 I’ve also been volunteering for the Kaikoura Ocean Research Insitute (K.O.R.I) for the last 6 weeks, weighing little penguin chicks, recording adult identification tags, and measuring eggs. 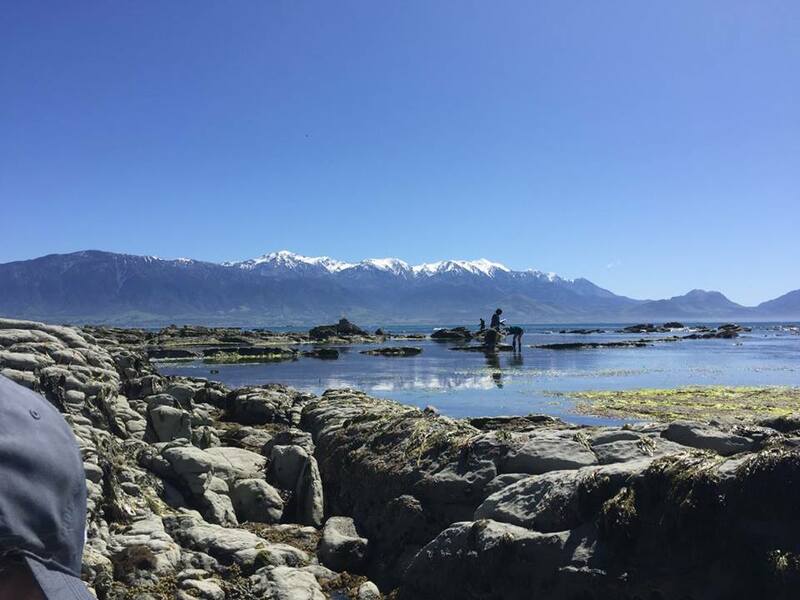 It’s been so special observing this part of creation and forming relationships with the researchers here in Kaikoura. As a group, we have also been involved in beach clean-ups with the local elementary schools, volunteering in various places throughout Kaikoura, and getting to know the locals through our time spent in town. Many of us have also returned to our homestay families to watch a rugby game or have dinner or just fellowship. 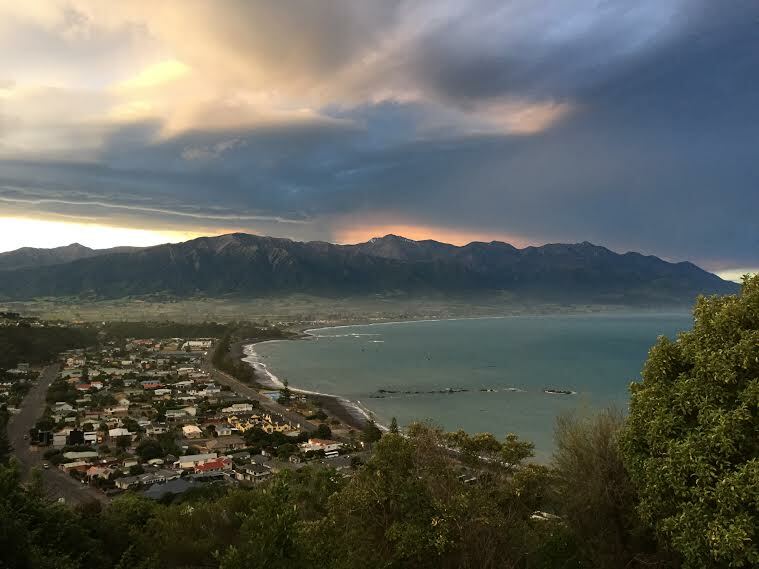 And beyond the people, we have become invested in the nature all around Kaikoura. 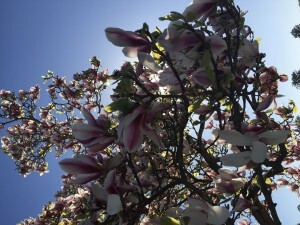 We have learned the names of the trees on our property and throughout the town, the local birds and marine life. 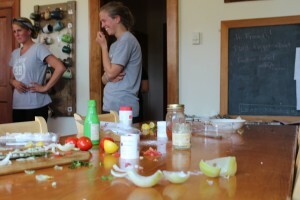 Because of this, we have found this deep sense of care for this place. 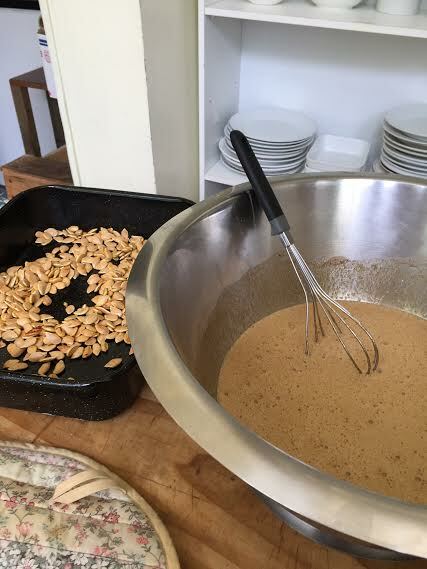 Making pumpkin pie from scratch for our Thanksgiving celebration! Come Friday, many tears will be shed as we say goodbye to the place and the people we have become so invested in, but how beautiful is it to be leaving a place with people to miss and people who will miss you! I take back my former advice to study abroad students and extend this to all. If I could tell anyone one thing, it is to be invested in your place. 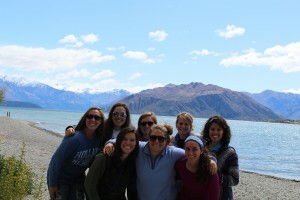 Whether you are studying abroad for a semester or remaining in the place you call home, become invested. Get to know your community, volunteer, and learn about the birds and trees around your home. When we make home and come to be invested in a place, we can’t help but feel this deep sense of love and care and that is one of the most wonderful feelings I’ve ever felt. All semester I’ve been thinking to myself, “Why doesn’t everyone study abroad?! 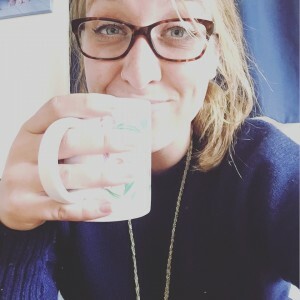 It’s probably the greatest thing ever!” So, I thought I’d make a list of 5 reasons why I think you should study abroad, or at the very least, travel. Culture is probably one of my favorite parts about traveling! 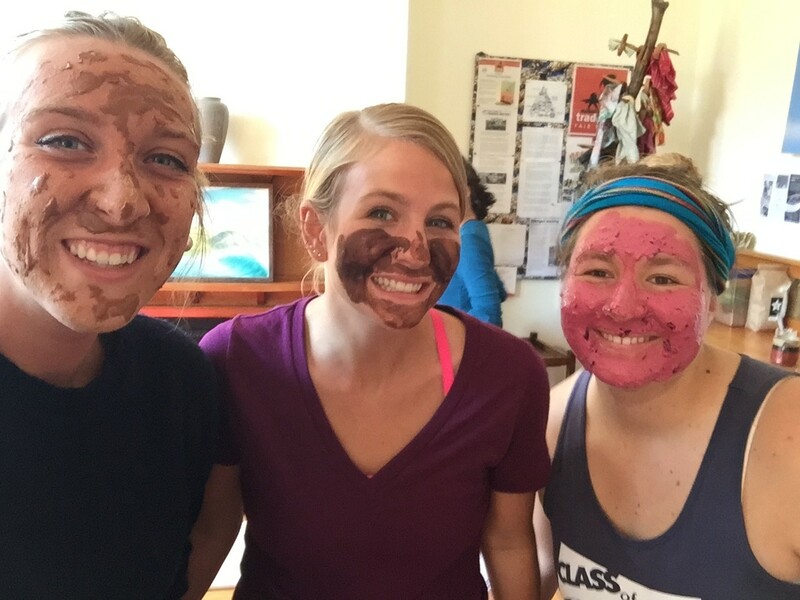 I love learning about different cultures and when you study abroad, you have the opportunity to really invest in a culture. In New Zealand, I’ve been fortunate enough to learn about and experience both the kiwi and Maori culture. I’ve watched rugby at 4 am with screaming fans, gone diving (aka snorkeling) off the shore, ate fish and chips, and enjoyed the good ole outdoors. 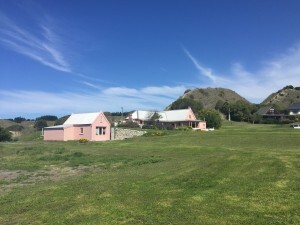 I’ve also been to a Maori powhiri (welcoming ceremony), hongi-ed people (Maori nose-to-nose greeting), and slept in a Marae (Maori meeting house) on the floor with 20 other people. And food. Food in other cultures is so good. Do it for the food. 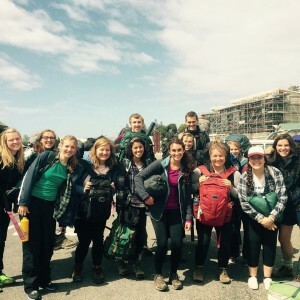 Another great part about traveling and studying abroad…you meet so many great (and interesting) people! 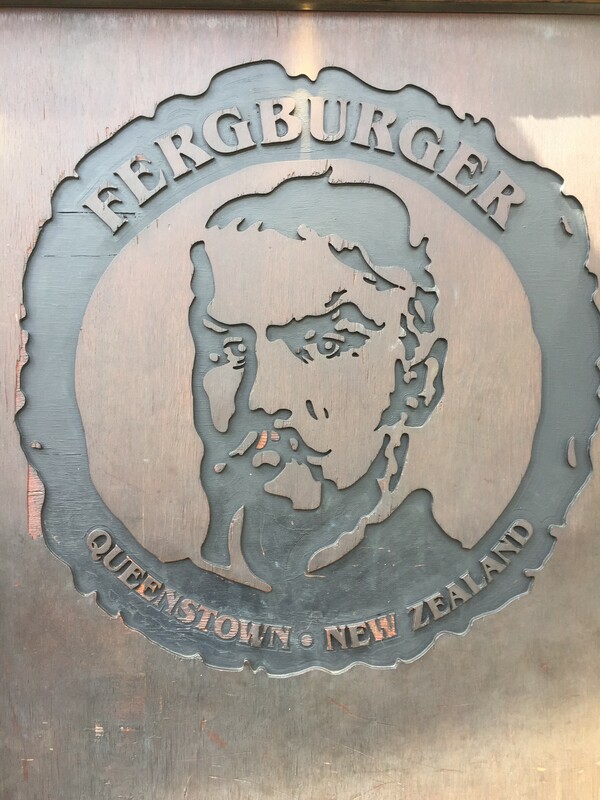 Even though I’m studying with all American students, I’ve met people from Germany, Ireland, England, Australia, Canada, and so many more countries simply by being in the community and traveling around New Zealand. You hear some pretty great stories when you strike up a conversation with people abroad. If the CCSP staff isn’t the quintessence of “interesting people,” I don’t know what is. I love me these folks! 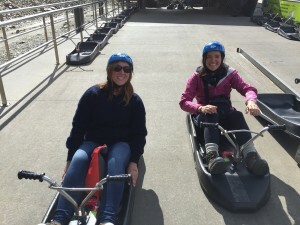 Hopefully in your time studying abroad you would learn something new educationally, but if all else fails, you can learn something new about yourself. 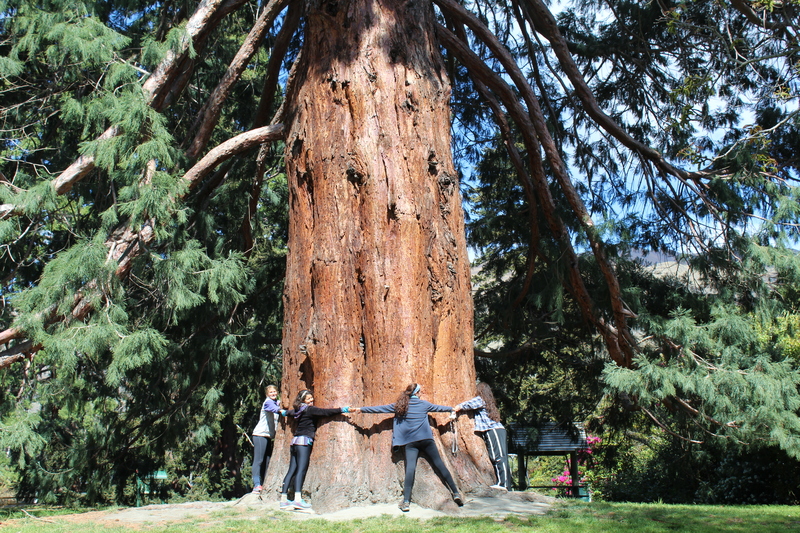 By studying abroad, I’ve learned so much about conservation and Creation Care, but I’ve also learned a lot about myself. When you bring yourself to a new and unfamiliar place, you’re in the perfect position to discover something new about yourself and that’s so wonderful! One of the best parts about traveling and studying abroad is just the cool stuff you get to see. 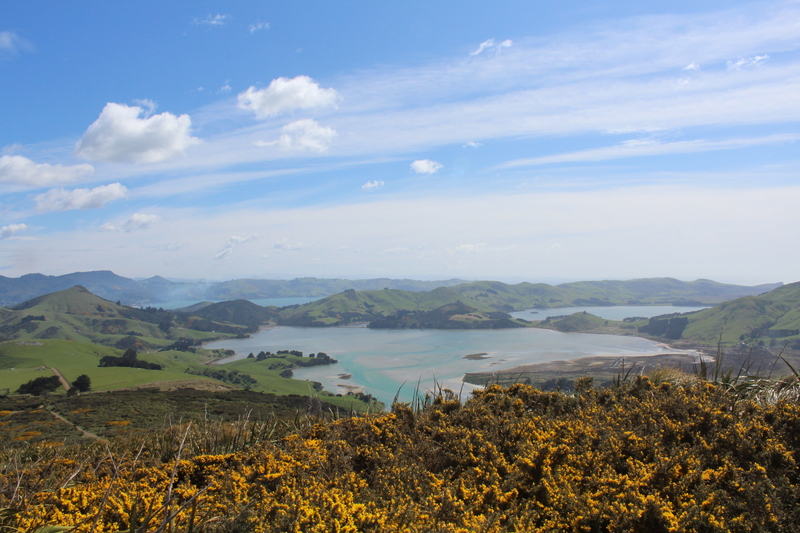 I went from the flats of Michigan to the mountainous regions of New Zealand. I live about a 5 minutes bike ride from an ocean teaming with wildlife and where the mountains run right into the ocean! Already this semester, I’ve seen a variety of native and endemic birds (even one in which Kaikoura is its only breeding place in the world! 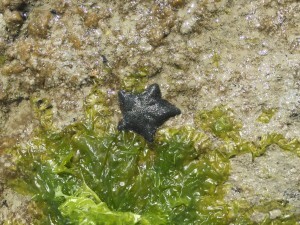 ), native vegetation, countless seals, 3 species of dolphins, and little blue penguins! And hopefully, I’ll see some whales in a few weeks time! The Takahe is an endemic and endangered bird to New Zealand that we were fortunate enough to see! So often, I heard students saying they couldn’t study abroad because they were a pre-med student or they just couldn’t fit it into their schedule. Being a biology major with a pre-veterinary focus, I was really discouraged and thought I wouldn’t be able to make it work. I was so determined to have this experience, though. Let me personally attest to the fact that it is possible! It may take some rearranging of the schedule and one or two summer classes, but it’s possible and totally worth it! 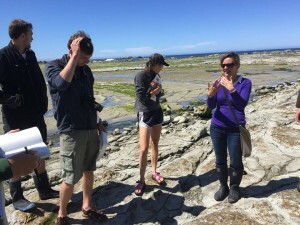 And for me, I found a program that fit well with my major and allowed me to take some classes in biology and environmental studies along with gain amazing experiences in field work. I’ve spent the last few weeks collecting data with researchers on the little blue penguin, learning so much and enjoying the cute penguin chick fluffiness even more! Field study is class done right if you ask me. Even if you’re just considering studying abroad, I hope this convinces you a little more! My semester has been the experience of a lifetime and I have gained friendships and connections I will carry with me into the future. I’ve learned so much both academically and about myself, and it’s hard to see this experience begin to come to a close, but have gained so much to take back to Hope with me! I have thoroughly enjoyed and learned so much from all of my classes thus far. From Sustainable Community Development to Environmental Literature to God and Nature, I have gained so much insight on what it means to be a good steward of Creation Care. Being a biology major and animal-lover, though, Marine Ecology was right up my alley. 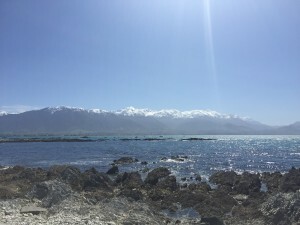 I’m going to be a science nerd for a moment and tell you just why Kaikoura is such a unique place for marine life! Just a few hundred meters off the coast of Kaikoura is a very deep underwater canyon (Kaikoura Canyon). Here, the warm tropic waters collide with the cold Antarctic waters, causing the up-welling of this nutrient rich water and causes the beginning of the food chain that supports a vast number of different marine organisms. Pretty cool, right? 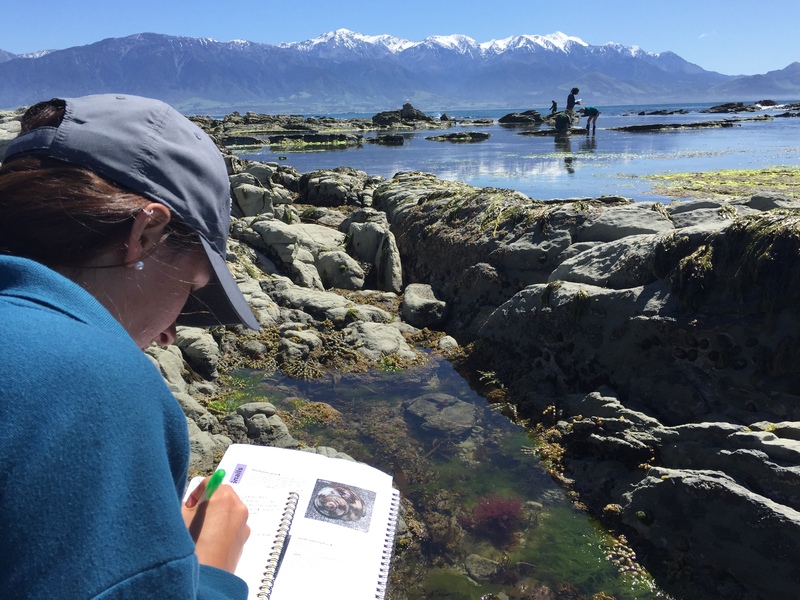 The focus of the week was studying marine conservation by studying the marine life in Kaikoura. On Monday, we studied Kaikoura’s invertebrates by spending the morning tide pooling. 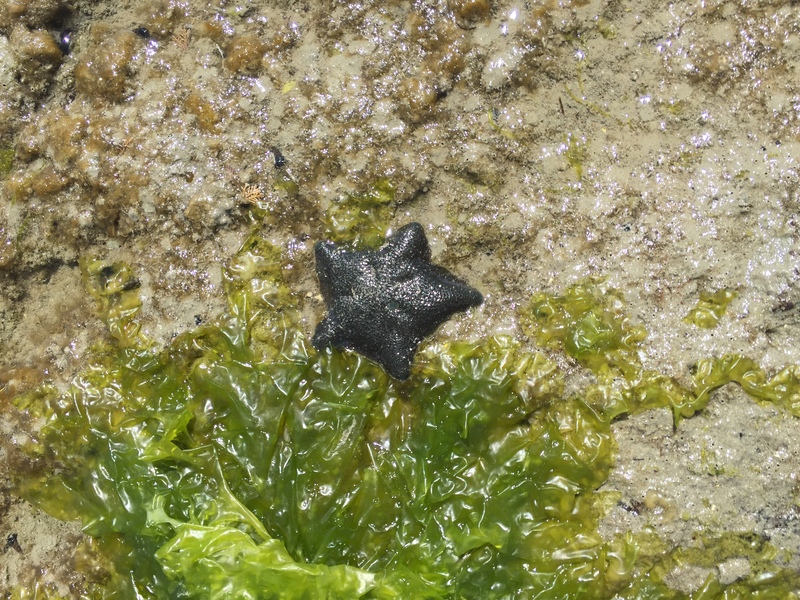 We saw sea anenomes, various barnacles and limpets, ghost shrimp, and a sea star! Tuesday, K.O.R.I (Kaikoura Ocean Research Institute) took us to visit the little blue penguin colony, the smallest penguins in the world! We got a sneak peak into their burrows and to watch the male return at night to his mate and little baby egg. 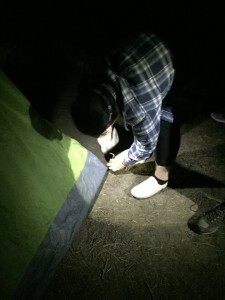 I actually also just began volunteering with K.O.R.I, recording the weights and measurements of eggs, chicks, and adults so we can better understand how to conserve the little blue penguin population! Check out their Facebook page, it’s a pretty great organization! Fur seal pups enjoying some play time at the Ohau stream! 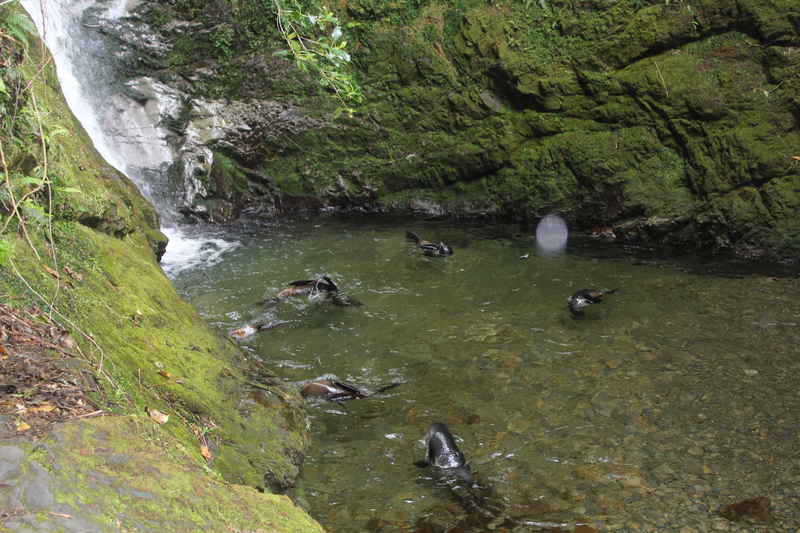 Wednesday we visited the Ohau stream to watch seal pups play under the waterfall and then visited the nearby fur seal breeding colony! A male elephant seal, about 5-7 years old parked himself on a rock in the middle of the colony which was a pretty amazing sight! 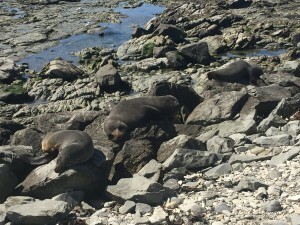 He is one of the only recorded elephant seals in Kaikoura in recent years so maybe he brings hope of a colony of elephant seals establishing themselves one day! 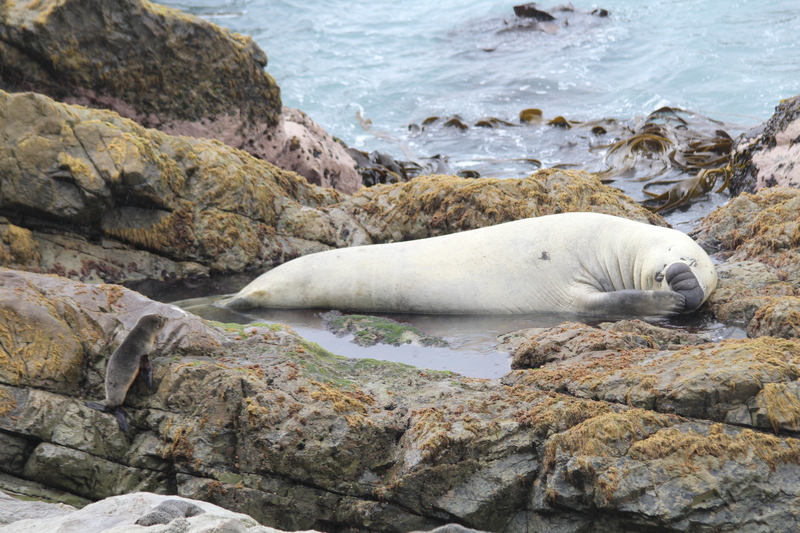 Just for size comparison, there’s a young fur seal in the lower lefthand corner to this juvenile elephant seal. He’s not even full grown yet! 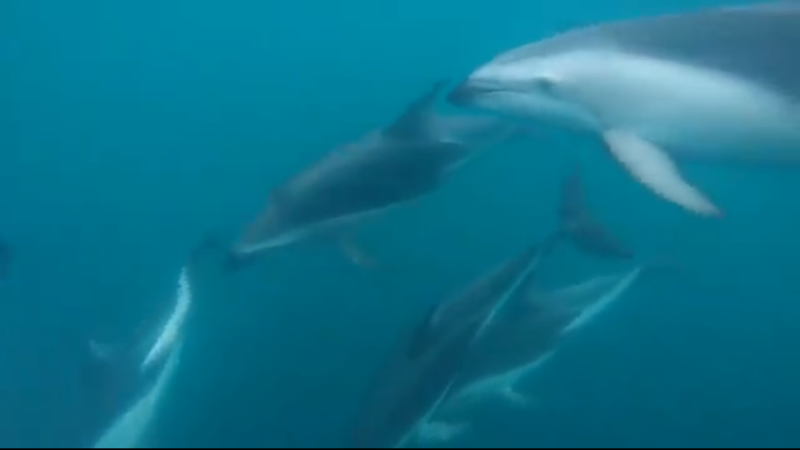 Here’s a GoPro screenshot of some the dolphins swimming by! Thursday was probably my favorite. We got up early to go swimming with dusky dolphins! 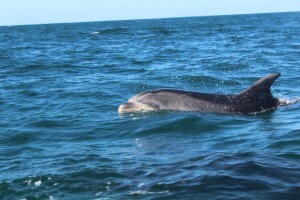 Kaikoura offers a pretty unique experience in that you swim with the dolphins in the wild! We took about a 15-minute boat ride to a pod of dusky dolphins where we slipped into the ice cold water (thank goodness for wet suits) and snorkeled while about 50 dolphins in total swam just feet from us! 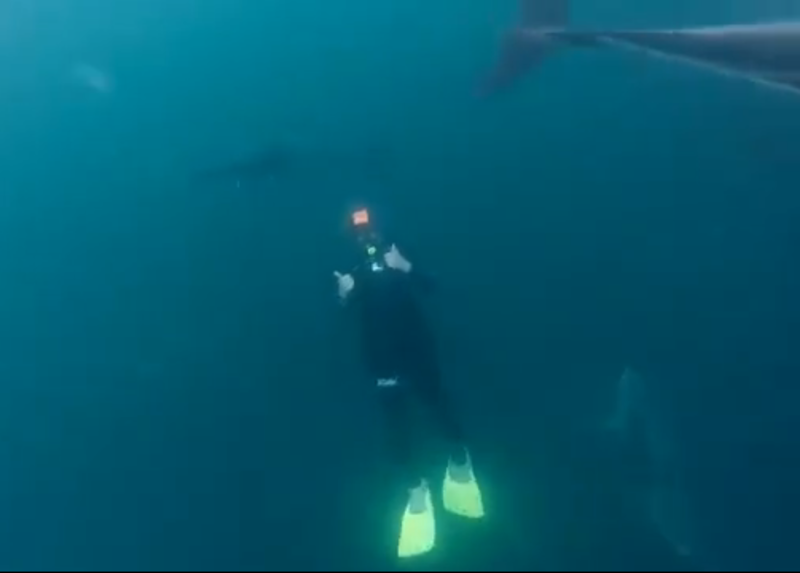 They loved when swimmers would dive down and would swim circles around us in numbers of five to ten! While most of the boat was seasick, I retreated to the top deck to observe the dolphins jumping and flipping and petrels and albatross flying by. We even saw Hutton’s Shearwaters on the way back. 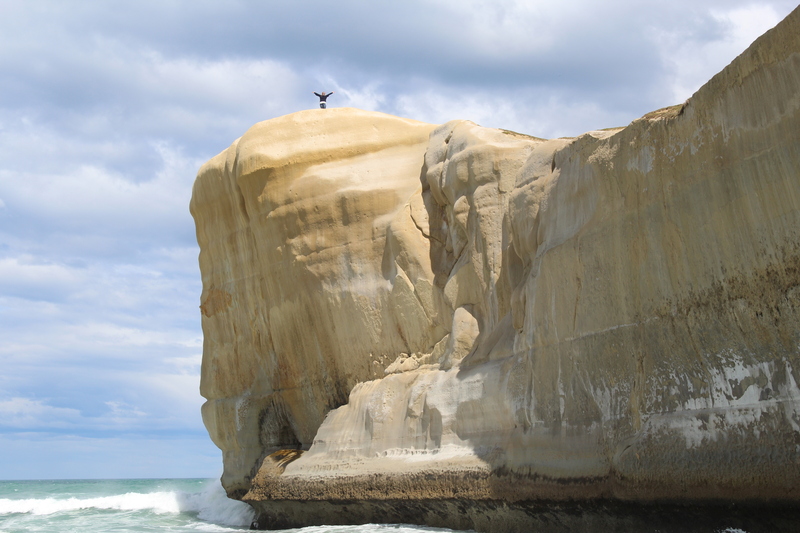 Fun fact: Kaikoura is the Hutton’s Shearwaters only breeding ground on the entire planet! 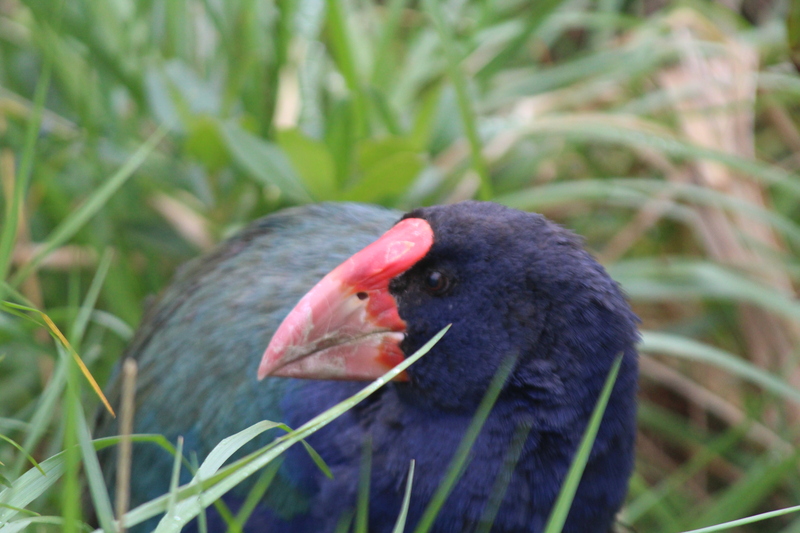 Some really awesome conservation efforts are in place to save the population. Fyffe House! 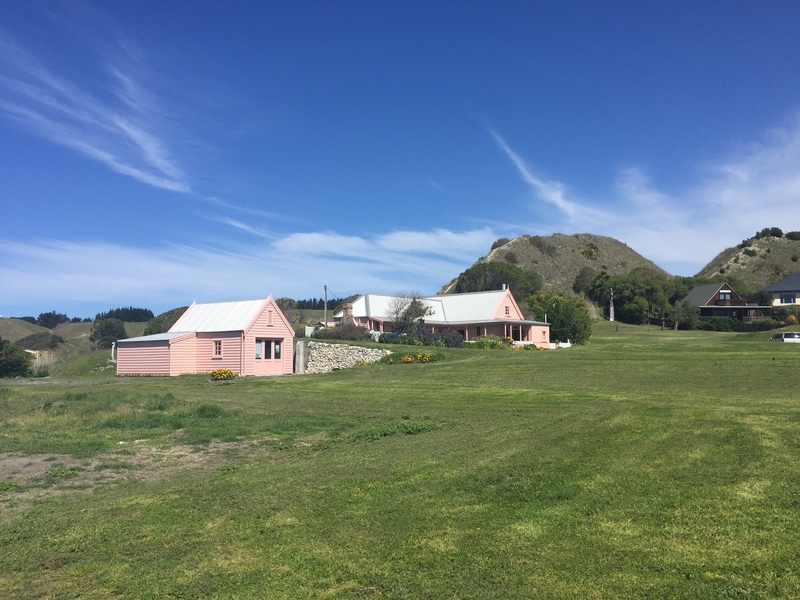 It contains a lot of whaling history and overlooks the bay where all the whaling once occurred! 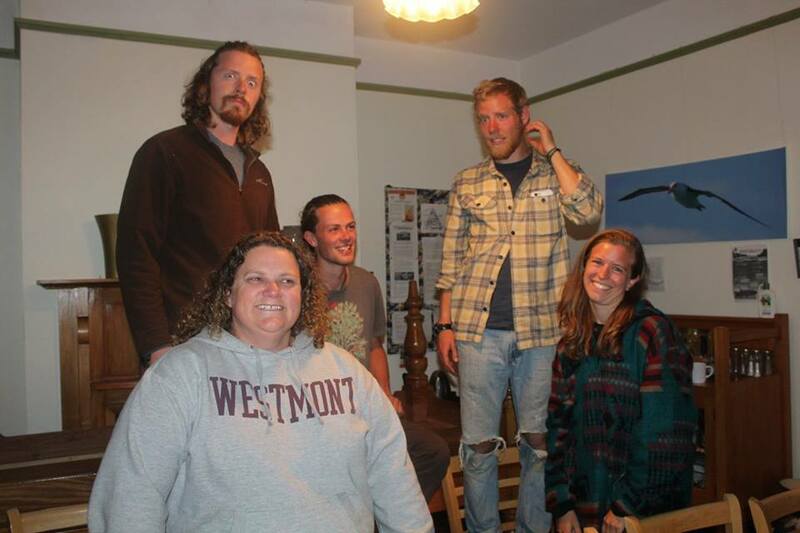 Friday we visited the Fyffe House, an old whaling house back in the day with a foundation made from whale bones! Kaikoura’s bays use to be roaring with southern right whales, so much so that residents would actually complain because their trumpeting kept them up at night! What a cool thing to imagine! Today, because of whaling, no SRWs remain in Kaikoura and their sighting is pretty rare here. 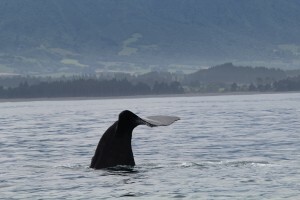 Kaikoura is a large bachelor pad for sperm whales, though! 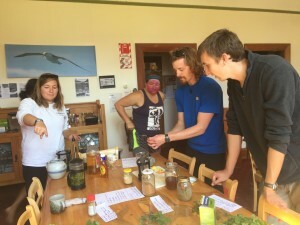 I have so much more I could share from the week about marine conservation, but that is a blog for another day. Every day I am reminded of just how special this place is! It’s hard to believe my time is coming to a close, but I’m sure I’ll still have many adventures to share! Creation is pretty great, isn’t it?! 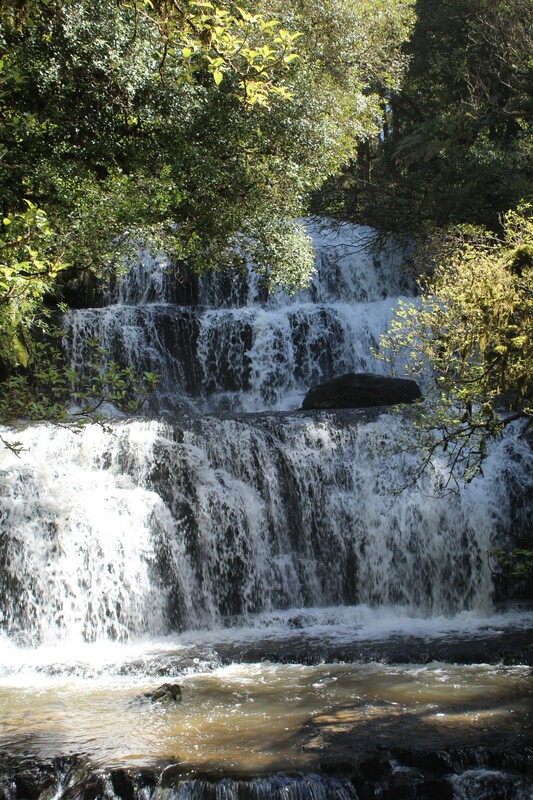 I couldn’t even fit the whole waterfall into the photo! 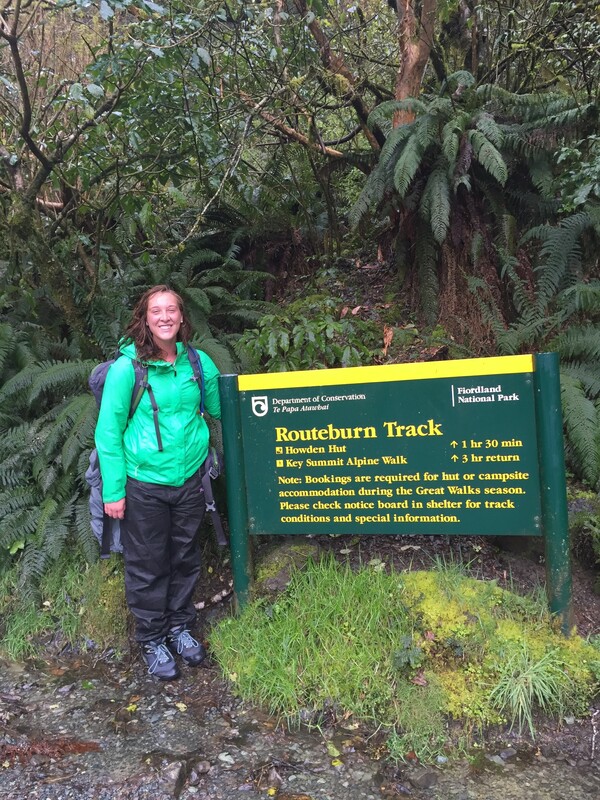 During the second half of term break, we were set to tramp one of New Zealand’s 9 Great Walks, but due to considerable avalanche risk in the middle of the track, we were only able to hike a portion of the track. 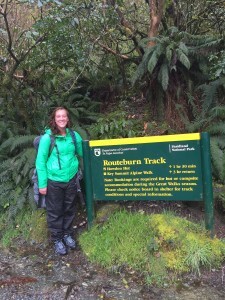 It was pretty cloudy most of the track, but I think that added all the more to the wonder and sublimity the walk. It was like walking through a movie. About two hours into the track, we came upon one of the most incredible views I’ve ever witnessed: a cliff, a couple hundred meters tall with water rushing down into a pond below. I only wish pictures could do it justice. 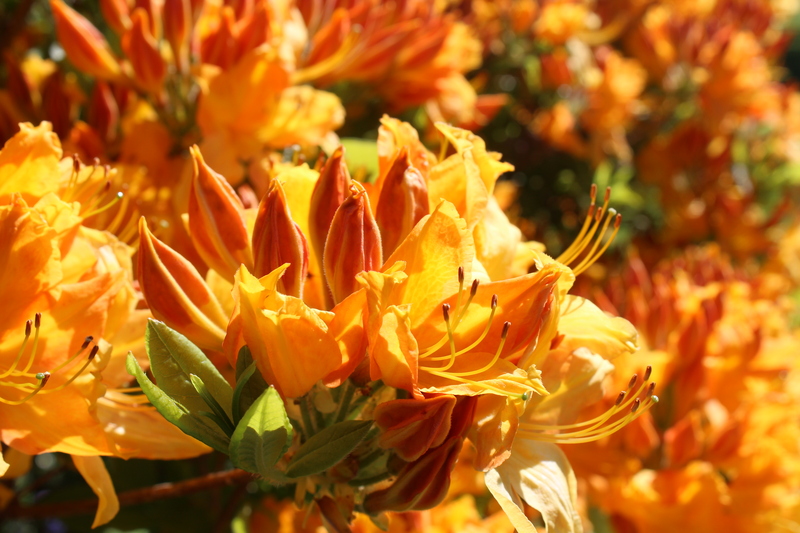 We stood in awe of this impeccable piece of creation for a moment before continuing on. 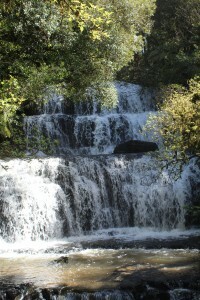 There definitely was no doubt as to why this was considered one of New Zealand’s Great Walks. 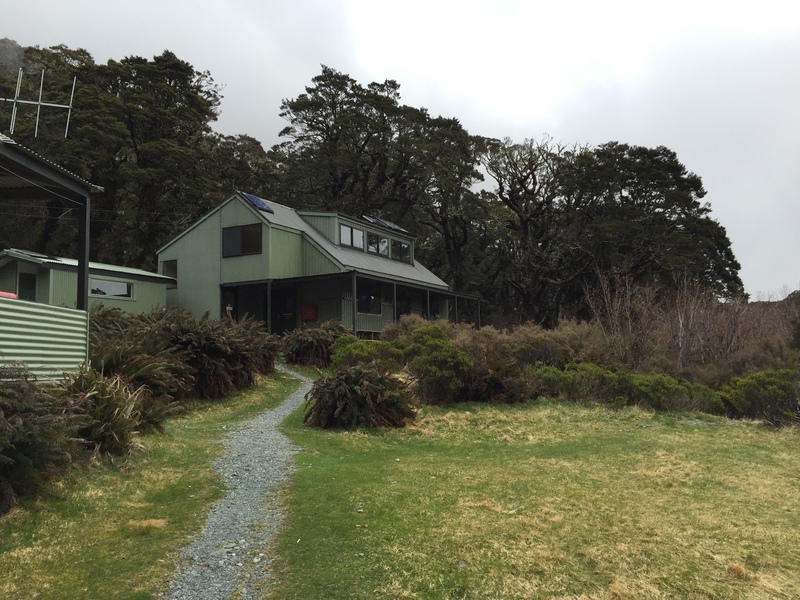 It took just over four hours to reach our DoC hut where we would spend the night. 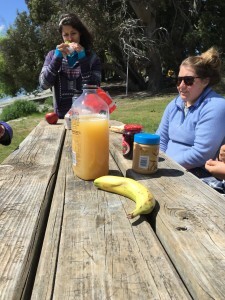 Legs sore from the long hike, we quickly ate our PB&J before heading straight for our beds. When the rain wasn’t letting up the next morning, we decided to head back out anyways. 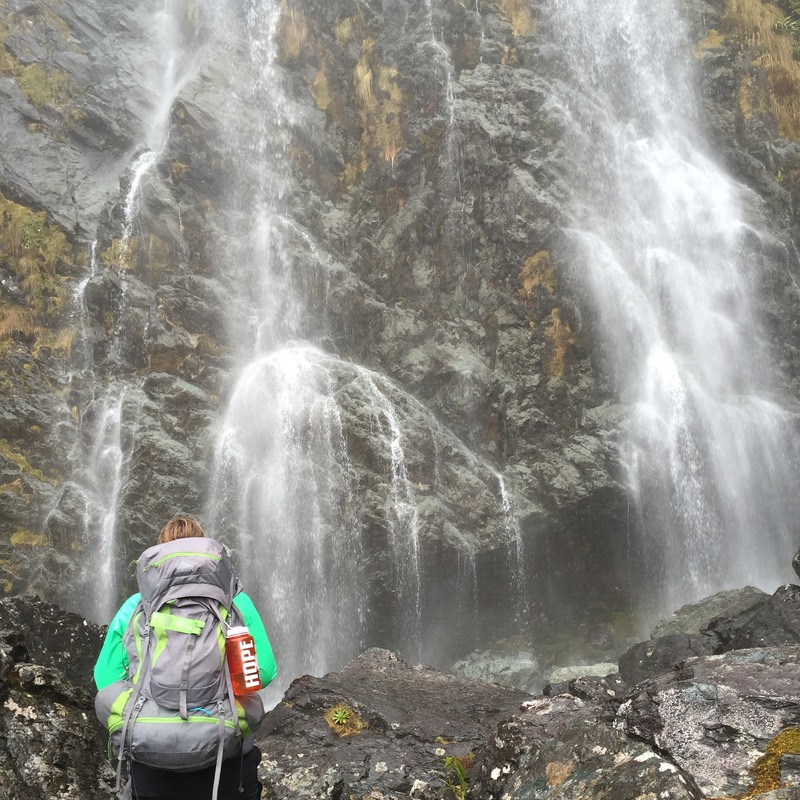 After some rushing stream leaping, thunder and lightning, running, and three ours of tramping, we made it back to the car park. 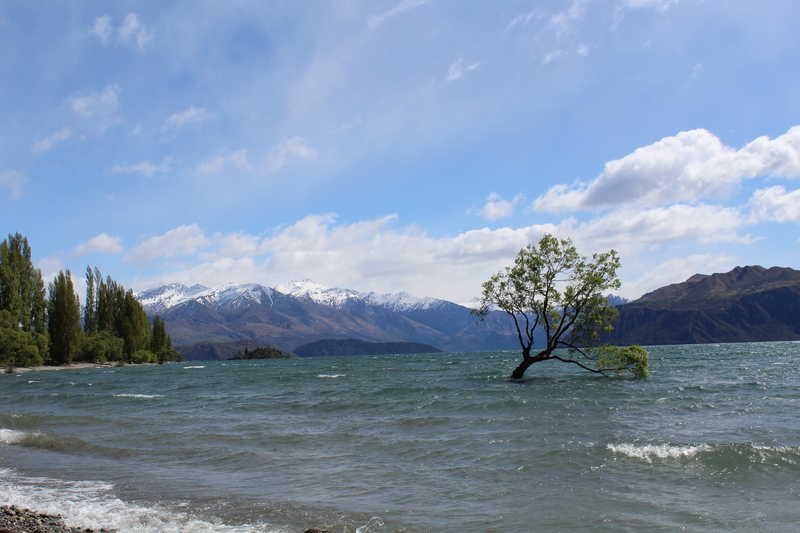 We were soaking wet, cold, and exhausted, but we had just witnessed some of New Zealand’s wonders and made it out mostly in one piece, so we were contented. We left in perfect time for Dunedin as the road closed shortly after due to considerable avalanche and tree falling risk. Tunnel Beach – probably a favorite of mine! 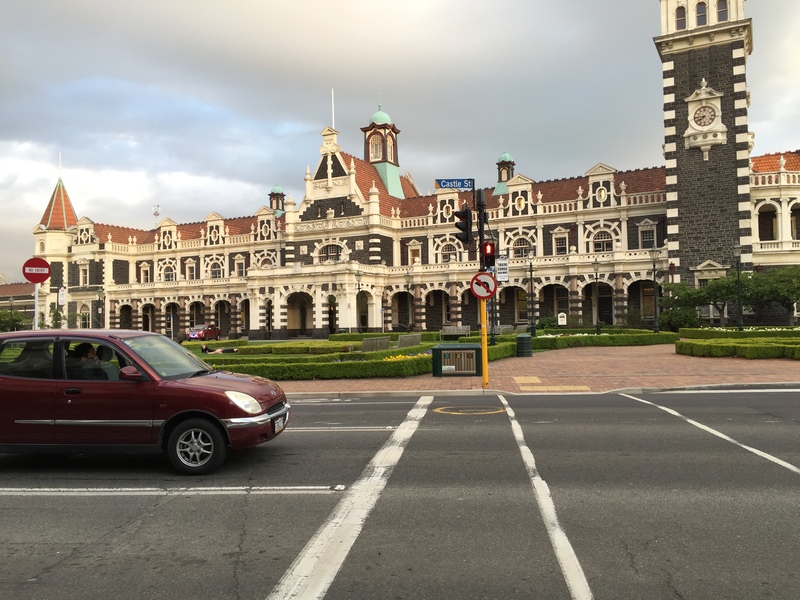 Dunedin is New Zealand’s university town so the streets were lively and coffee shops were every ten feet. Our first day in Dunedin was spent taking a scenic drive to Nugget Point for some more amazing views before spending the afternoon in the Botanical Gardens for a walk and nap amongst the spring blooms. 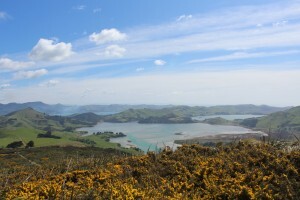 Day 2 consisted of a drive around the Otago Peninsula in search of some penguins and albatross but had no such luck. We did take a walk through the sand up to Sandymount for some panoramic views though. The walk continued through sheep pastures to The Chasm and Lover’s Leap. 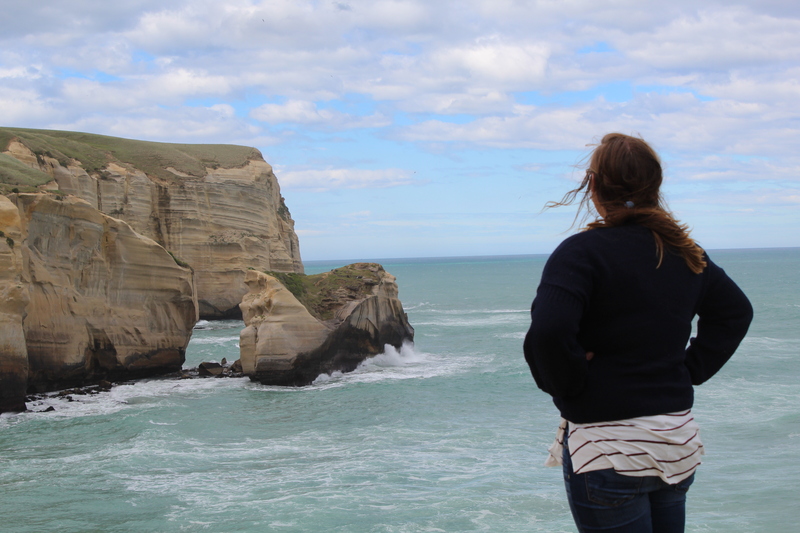 We ended the day at my favorite place on the entire trip: Tunnel Beach. If you want to realize just how small you are in this big world, go to Tunnel Beach and stand on top of the cliff and have someone take your photo from below. Sometimes I can’t help but imagine how much fun God probably had in creating such wonders. 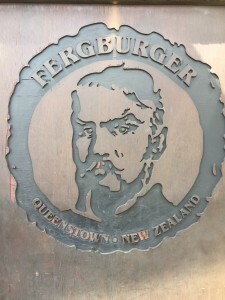 New Zealand definitely must have been a favorite of His. 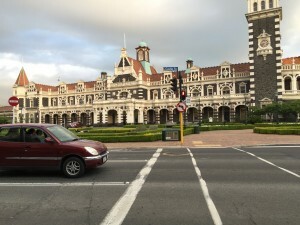 The most photographed railway station..I can imagine why! 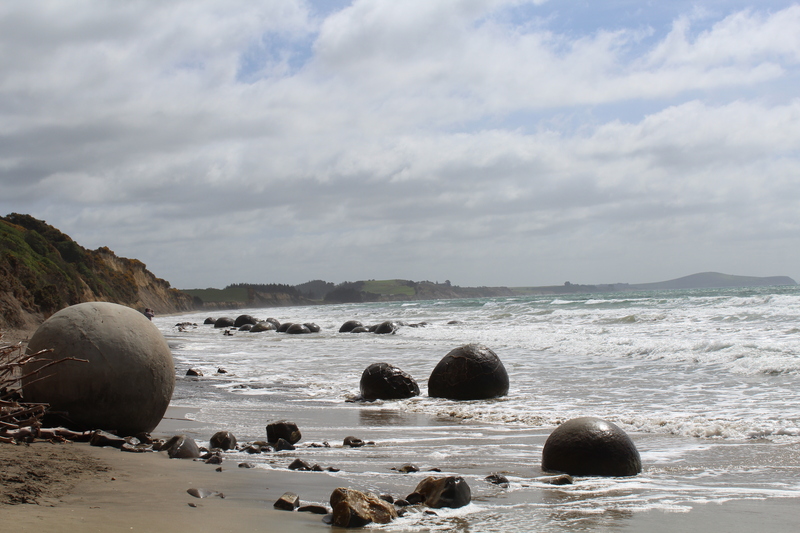 Moeraki Boulders…really awesome geologic formations for the geology nerds out there! 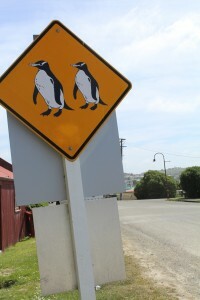 In New Zealand we have penguin crossing signs instead of deer. 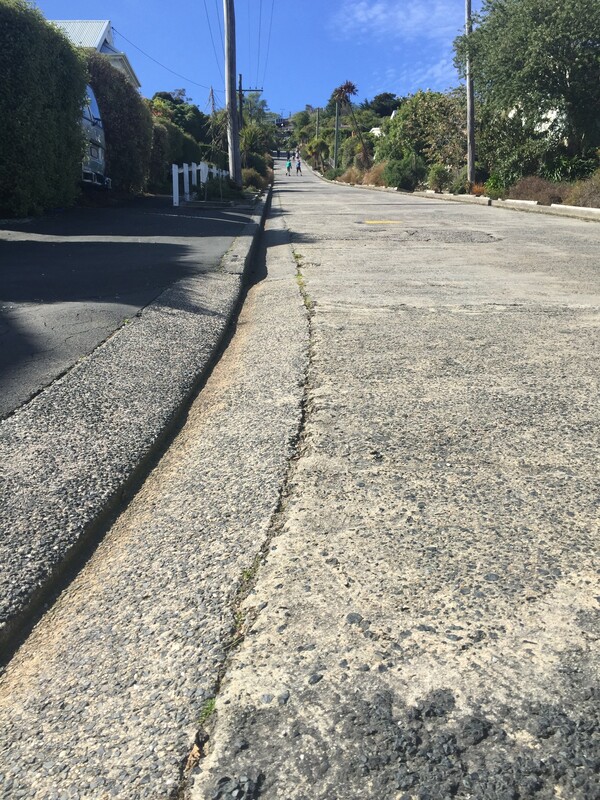 The steepest street in the world! On our final day in Dunedin, we took a walk up the steepest street in the world, killing our calves even more, before heading north toward Christchurch. We made stops along the way, visiting the Moeraki boulders (a really cool geologic formation) and an old Victorian town. We spent the night in a small town at a friend’s mom’s farm. We fed baby lambs, watched the sunset, got our cute dog fill, and ate a real meal that did not involve peanut butter or jelly. 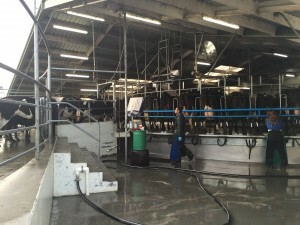 We also visited her work the next morning to get a sneak peak at the milking industry. Aside from the cow dung that ended up all over my clothes, it was a pretty neat experience. We concluded our journey in Christchurch where we caught a bus back to Kaikoura. By the end of the trip, my wallet was empty but my heart was so full. I experienced so many of New Zealand’s natural wonders, grew in fellowship with four wonderful women of Christ, and ate my weight in PB&J. 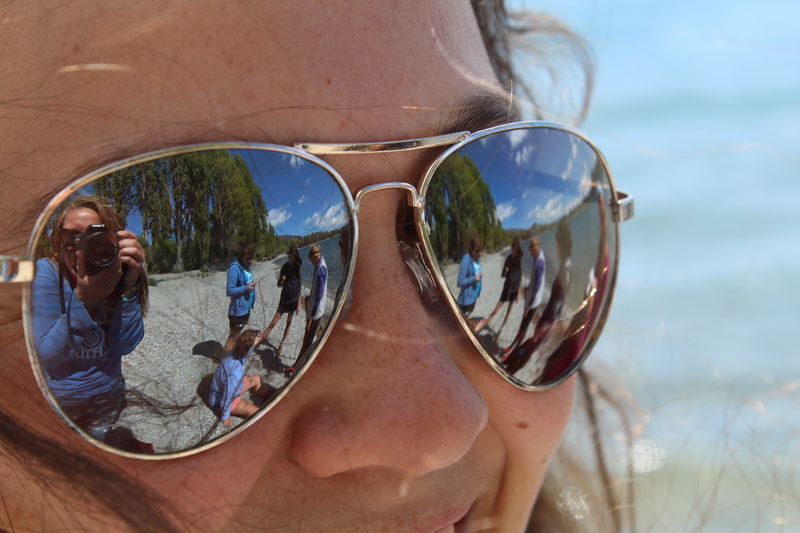 Thanks for memories this week, New Zealand. The best part about living in a small town is the community. Everybody knows everybody and, undoubtedly, everybody knows about the American students living in The Old Convent. 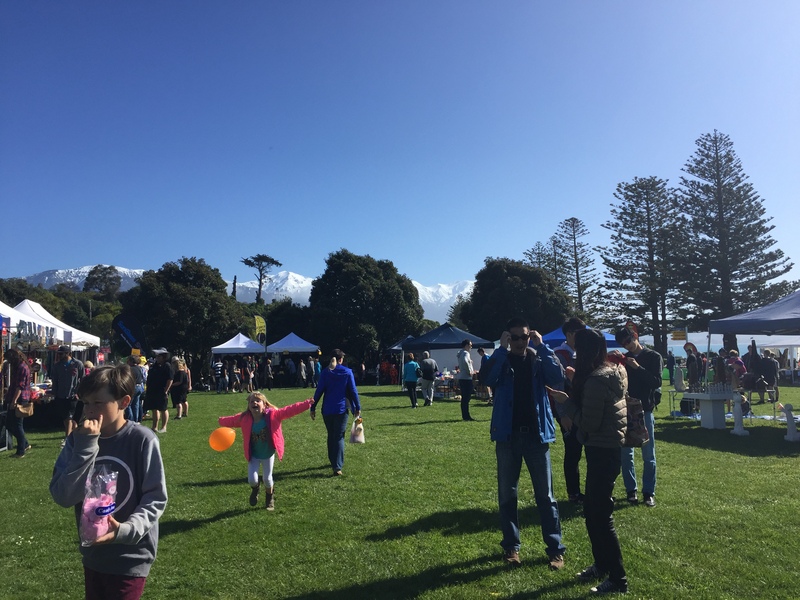 Kaikoura only has a population about the size of Hope’s, so throughout the last 6 weeks, we’ve had the opportunity to meet members of the community through BBQ’s, churches, and local shopping. This past weekend, though, we had the opportunity to live with some of these families and learn a little bit more about the New Zealand culture. Marion bought us all stick on lips…I think she pulls it off the best! A Calvin student, Sadie, and I stayed at a widowed woman’s home who recently returned from 4 years teaching in Tanzania. She’s probably the coolest lady I’ve ever met. 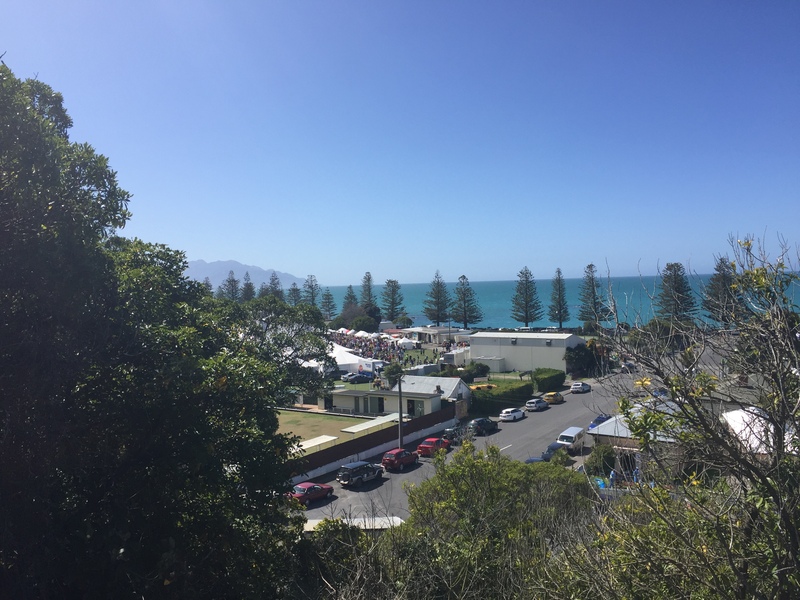 We spent our weekend going to all the best lookout points in Kaikoura, shopping the local market, eating ice cream, coloring, watching kiwi T.V., and putting temporary tattoo lips on just because.. so pretty much the greatest weekend ever. 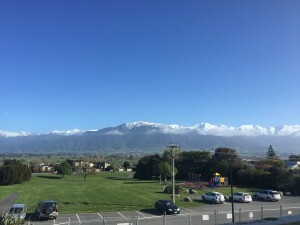 Another capture of the mountain range on a sunny day! The town was packed with Seafesters! It was also Seafest this weekend in which people from all over come dressed in crazy costumes to socialize at the marque in town. 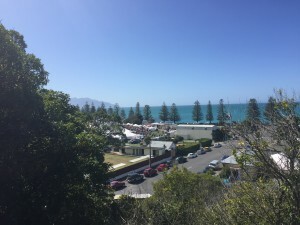 Seafest tends to mark the beginning of tourist season in Kaikoura. Around 6,000 people (2,000 more than the population) arrive for Seafest but over 1 million tourists come to Kaikoura each year as it is one of the most sought after tourist destinations for its whale watching. This quaint little town can pack a lot of people. Little trip down to the seal colony! 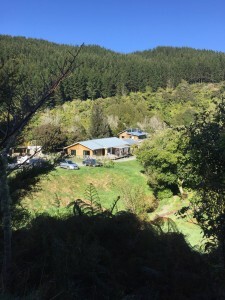 We came to homestay with a backpack full of clothes and expectations for a great weekend but left with exceeded expectations, a new kiwi mum, and a key to her home so we can visit anytime. Plans for weekly dinners and coffee time are already in the works. 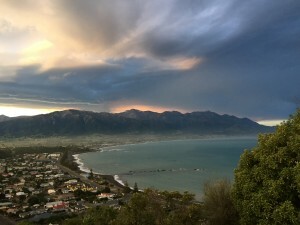 There truly is something so special about Kaikoura and its people. Last week, CCSP ventured to the north island across the (extremely rough) waters to study sustainable community development from the perspective of several different people in society. 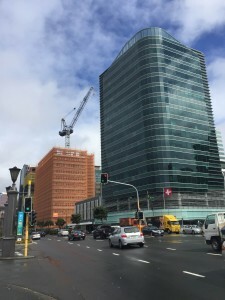 Wellington (aka “Windy Welly”) is the capital city of New Zealand with a population about that of Grand Rapids, so a relatively small capital city. 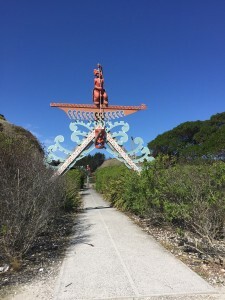 The first three nights were spent in a marae (“mar-eye”), a traditional Maori meeting house. 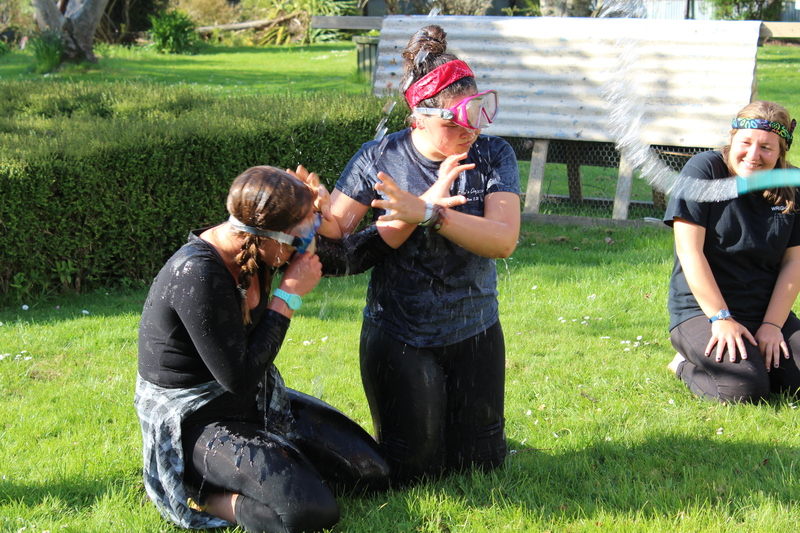 In order to enter, we had to go through a powhiri (“po-furry”), or a greeting ceremony, where we gave speeches, sang a Maori song, gave a gift, and greeted everyone with a hongi (nose to nose, forehead to forehead greeting). The sleeping arrangements included mattresses lined down the room side by side, so it was quite a cozy three nights! Unfortunately, no photographs are allowed in the marae, but the carvings are impeccable! 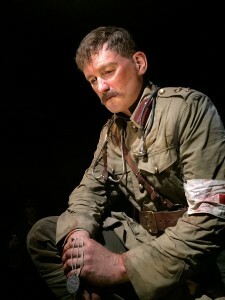 While in Wellington, we visited Te Papa museum, including a very realistic World War I memorial. 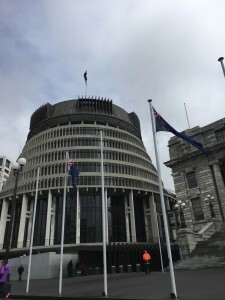 Later, we also visited parliament (“The Beehive”) to learn much about policy making in New Zealand followed by Naenae Boxing Academy where boxing champion Billy Graham talked to us about being in community and making a difference in the neighborhood. Our days included many other members of the community speaking on and doing various things to improve society. It was an eventful couple of days! I couldn’t believe how realistic these sculptures in the WWI memorial were! 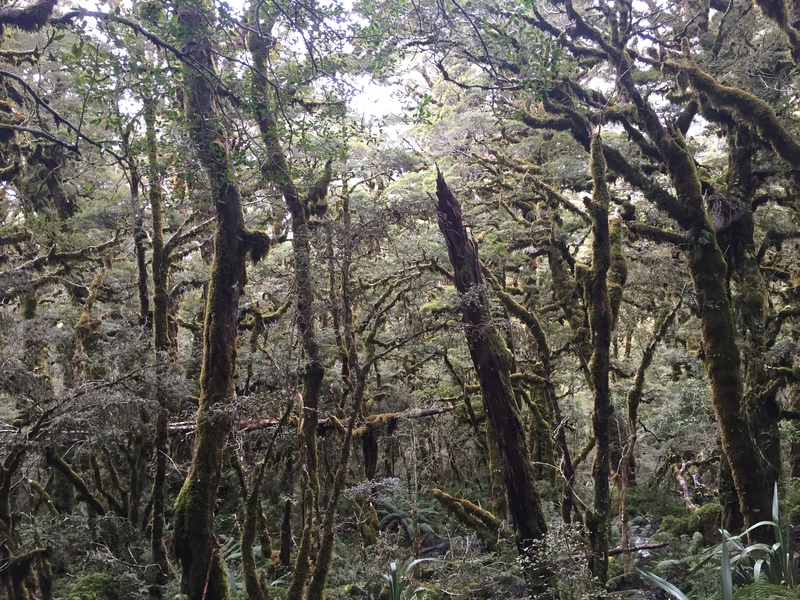 On our way out of the city, we stopped to visit a large, predator-proof reserve for some of New Zealand’s most endangered species. We spent a couple hours walking through the reserve, admiring the songs of the thousands of birds and the beauty in all the species present. New Zealand is quite a special place when it comes to its wildlife. 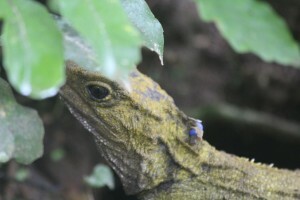 This little guy’s species, the was around during the time of dinosaurs and is the only left in its order! 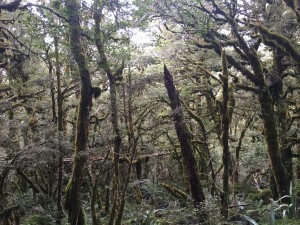 After Zealandia, we drove to Ngatiawa to stay in a monastery for a few days. The premises of the monastery is a commitment to worship three times a day. 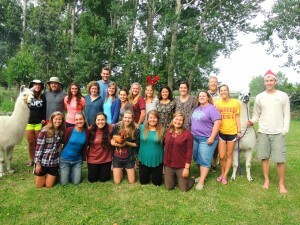 It was so refreshing being tucked back in the hills and having intentional time in prayer and worship each day. Ngatiawa River Monastery is a place set up by Urban Vision for people to retreat to for relaxation, recuperation, or rehabilitation without the stress and pressures of city life. 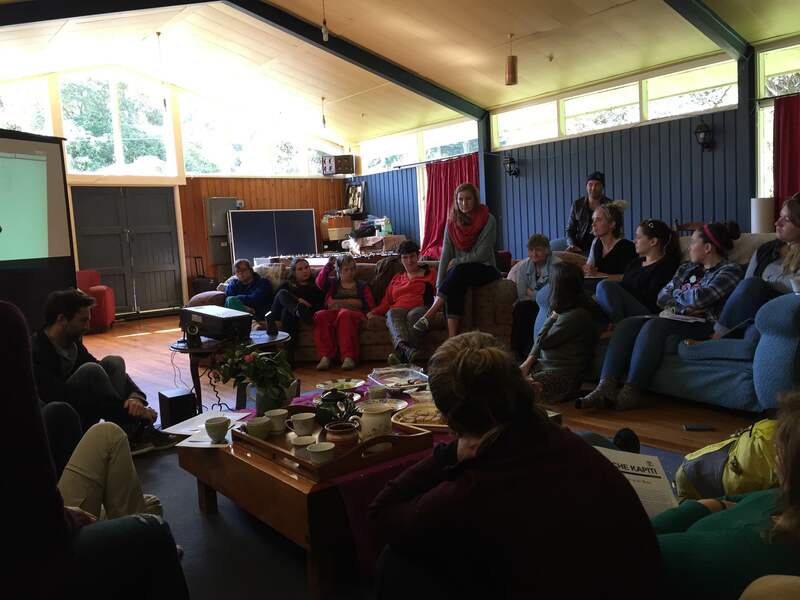 While in Ngatiawa, we also visited a man who takes a very strong opposition to war and has committed his life to living in voluntary poverty. I found the things he said very challenging, particularly because of the society we are raised in. I’m not sure I could ever use newspaper for toilet paper or build my home on a truck bed, but Adi’s challenge to society to live more simply and consume less definitely left us all with things to ponder. With the state this world is in, things are going to need to change and soon…and consuming less and living a more simple life may be the answer. It goes against all that modern society teaches, but maybe that is just what we need. 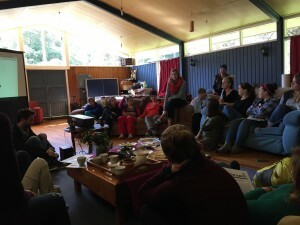 Our last day on the north island (and finally a sunny one) started off with meeting with L’arche New Zealand. 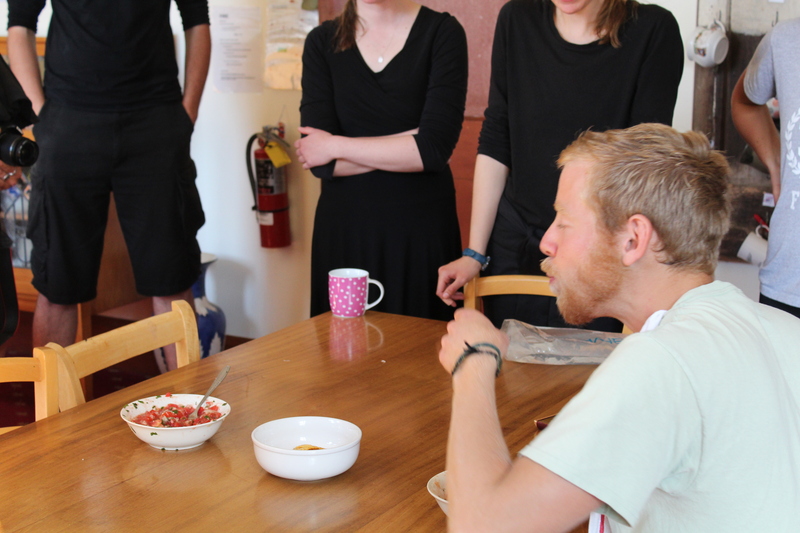 L’arche is about people both mentally disabled and not living in community together. 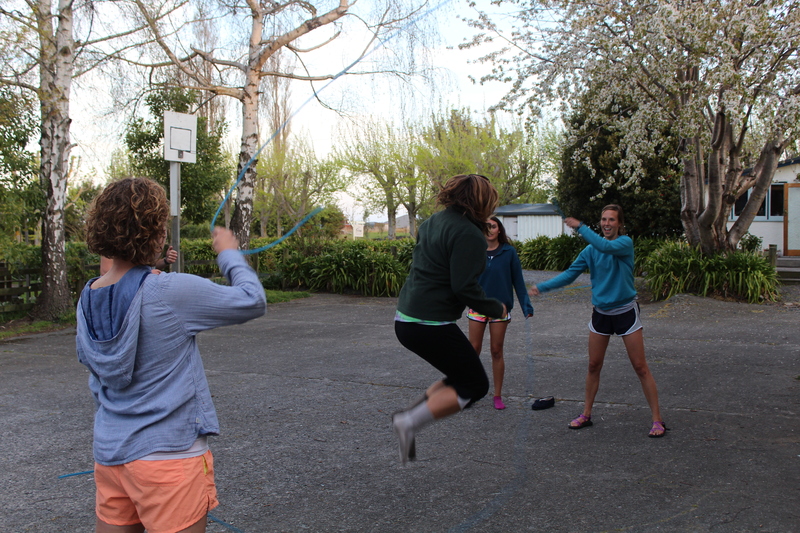 Actually, a recent Hope grad is currently working with L’arche New Zealand, so it was a really great running into her! The rest of the day was a free day in Wellington city. 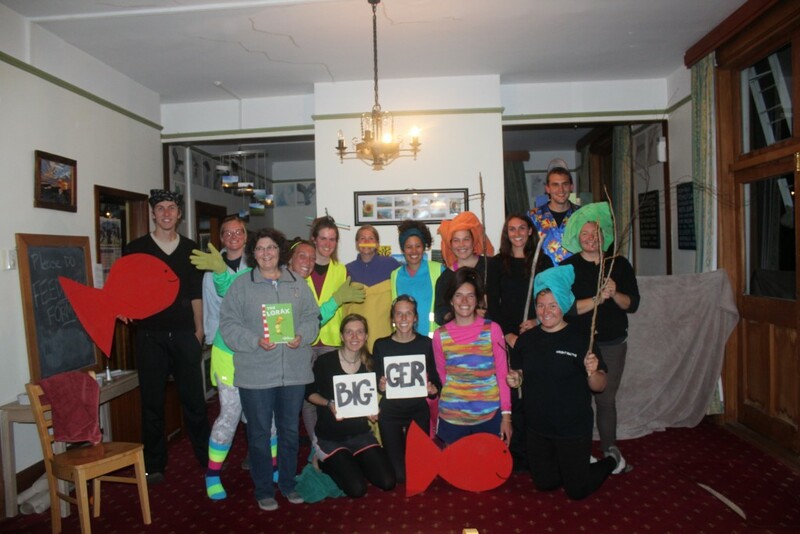 A group of us enjoyed a day together walking the streets, wandering through the night market, and playing pool at a local pub. Still can’t comprehend that this is my backyard. 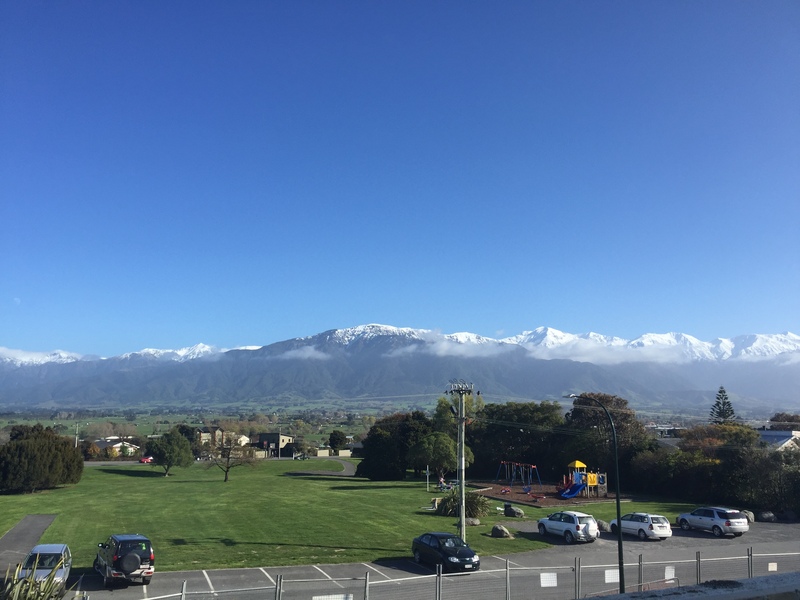 The city has been great, but nothing can top the crisp mountain air and fresh ocean breeze that comes from our home in Kaikoura. 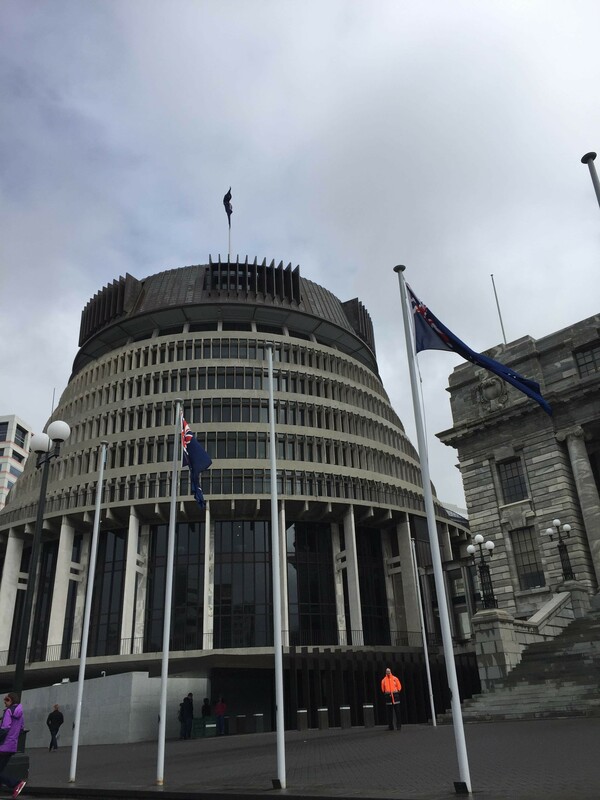 And, I can’t wait to put into practice and study more some of the things learned this week in Wellington. 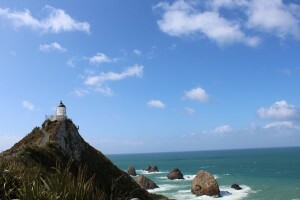 North island, it’s been a real treat.